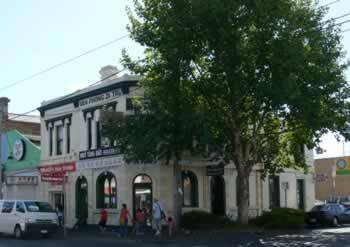 The hotel was constructed for Irishman John Falvey, who owned a number of properties in neighbouring Lithgow Street. He may even have done some of the building, as he was a contractor. Ownership of the hotel remained in the family after his death in 1877, and for several years in the 1890s his widow Maria was the licensee; after her death in 1893 Miss Julia Falvey ran the hotel. It is a good example of the Italianate style applied to a commercial building, with unusually detailed facades in intact condition.